Norton Conyers is a mid-14th Century house in North Yorkshire, England with Tudor, Stuart and Georgian additions. The home has been owned and occupied by the Graham family continuously since 1624. In the midst of a major renovation several years ago, the current Grahams discovered sizable fragments of this large scale paper in the Head Housemaid’s Room. Tax stamps on the back of several sheets can be used to date the paper between 1715 and 1786, but the style and character of the pattern suggest a date close to mid-century. 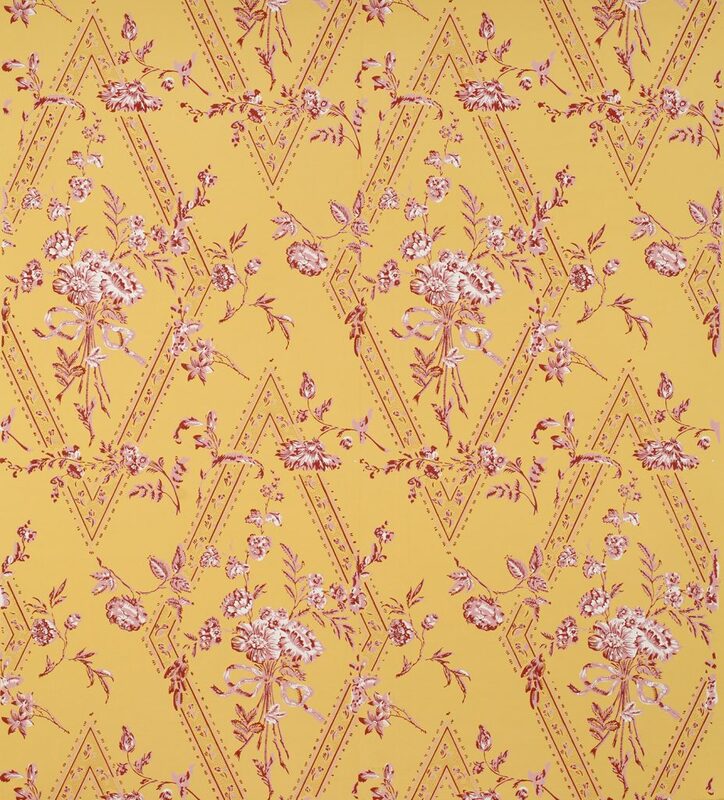 Though more formally structured than Adelphi’s West St. Mary’s pattern, (circa 1765) it does share some similarities. Their first colors are printed as rather amorphous patches of color; the subsequent colors, more delicately rendered, delineate the overall format in straight lines or meandering ribbons. Though the majority of the document had long since settled into shades of grey and murky red, a small section had been covered with a border and therefore retained the remarkable mid 18th century colors which Adelphi has accurately reproduced in the historic colorway. Imperial Measurements: Repeat 42 inches, width 21 inches, length 11 yards, straight match. Metric Measurements: 106.7 cm, 53.3 cm, 10 m.